Most people wouldn't think to go to their chiropractor for plantar fasciitis, but I'm here to educate you on the condition and why chiropractic care can help! Plantar fasciitis is a term often used for pain on the bottom of your foot or by your heel. We can start by defining it by looking at the parts: plantar means the sole of your foot, fasciitis (fascia + itis) means inflammation of the fascia. Fascia is the science word for the connective tissues that cover your muscles and tendons. 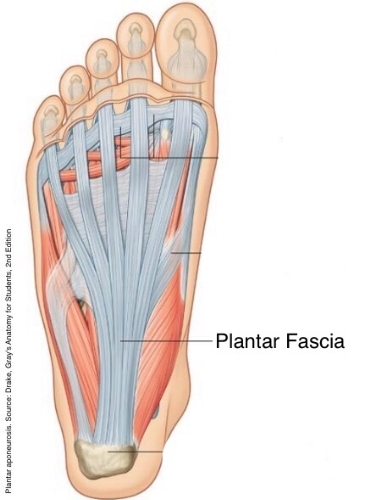 The plantar fascia is the thick piece of connective tissue that runs from your heel bone (calcaneus) to each of your toes. Check out this anatomy pic below to see the thick band of plantar fascia. So now that you know the definition of plantar fasciitis and you can picture the plantar fasciitis, we have to figure out what CAUSES that inflammation of the plantar fascia. A likely cause is simply irritation either deep to the fascia or more superficially. First we will look into causes of irritation deep to the plantar fascia (between the plantar fascia and the bones in your feet). Not to overwhelm you, but under the plantar fascia there are FOUR layers of muscles and tendons before you even reach the metatarsals! 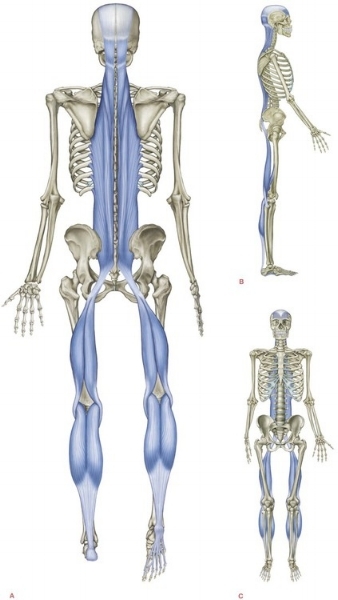 You have the abductor hallucis, flexor digitorum brevis, abductor digiti minimi; lateral plantar nerve and artery, medial plantar nerve and artery; quadratus plantae, lumbricals, tendons of flexor hallucis longus and flexor digitorum longus; adductor hallucis, flexor hallucis brevis, flexor digiti minimi; interossei. It's easy to look at your foot and go, "there's no way all of that is in there!" They are though. There are 26 bones in your feet! Your body needs to be able to control the movement in all of those joints. If any of those muscles get tight/spasm, they may alter the functioning of the joints in your feet. That may be enough to trigger the inflammation of your plantar fascia. Second we will dig in to a more superficial cause of irritation to the plantar fascia. What is more superficial than the superficial back line (well aside from skin)? Some of you may be thinking, the superficial back line? What does that even mean? Based on Thomas Myers and his book Anatomy Trains, there are fascial lines through out our body that work to support us and help us perform various movements/tasks. One of the contiguous fascia lines is the superficial back line. The plantar fascia is the first part of the superficial back line. The line consists of the plantar fascia, heel bone (calcaneus), calf muscles (gastrocnemius/Achilles tendon), hamstrings, sit bone (ischial tuberosity), sacrotuberous ligament, sacrum, the muscles that run along side your spine (erector spinae), and the fascia on your skull. Many times when one of the parts of this fascial line isn't working properly, that imbalance travels along the fascial line, and pain/dysfunction follows. So a problem in any of those areas can present as plantar fasciitis. Plantar fasciitis is often associated with walking, running, tennis, gymnastics, and basketball. This doesn't mean that it HAS to be a result of this or more problematic during those activities. People with plantar fasciitis usually have pain in their foot that is worse when they wake up in the morning or after long periods of rest. Pain often increases with toe rises or running. The pain can also increase towards the end of the day. The pain is often noticed along the inside arch of your foot close to your heel bone (calcaneus). There may also be pain/tenderness to the touch of the bottom part of the foot. First off, a chiropractic exam is performed to determine the cause of the plantar fasciitis. A series of orthopedic tests and palpation of the muscles and joints give us a good understanding of what is causing your pain. Through this exam, we can usually identify what the cause(s) of the pain are. The cause of the plantar fasciitis dictates the treatment. If the cause is deep to the plantar fascia, the treatment will be aimed at muscle release to the muscles in the foot and the muscles in the calf whose tendons run deep to the plantar fascia. After assessing the motion in the joints of the foot, often times adjustments may be performed on the foot. If the cause is along part of the superficial back line, the treatment will be targeted at the area causing the problem. Muscle release or work on the tendons and ligaments may be performed to help "slacken" the superficial back line and take pressure off of the plantar fascia. Adjustments may be performed on the back, pelvis, and/or the leg and foot. Some patients may have multiple causes contributing to their plantar fasciitis, so we treat all the causes. We are also a big fan of home stretches and exercises to help eliminate future flair ups. After your first treatment, we will go through those exercises and make sure that you are comfortable with your home care stretches. There is no need to live with insistent, irritating foot pain. Call us today!